I love this picture of Christine! Photo by Getty Images. An article by Vanessa Friedman of The New York Times about a new exhibit at London’s Design Museum called Women Fashion Power on how, in the museum’s words, “princesses, models, CEOs, Dames and designers have used fashion to define and enhance their position in the world” reminded me how much I like the style of International Monetary Fund Managing Director Christine Lagarde. 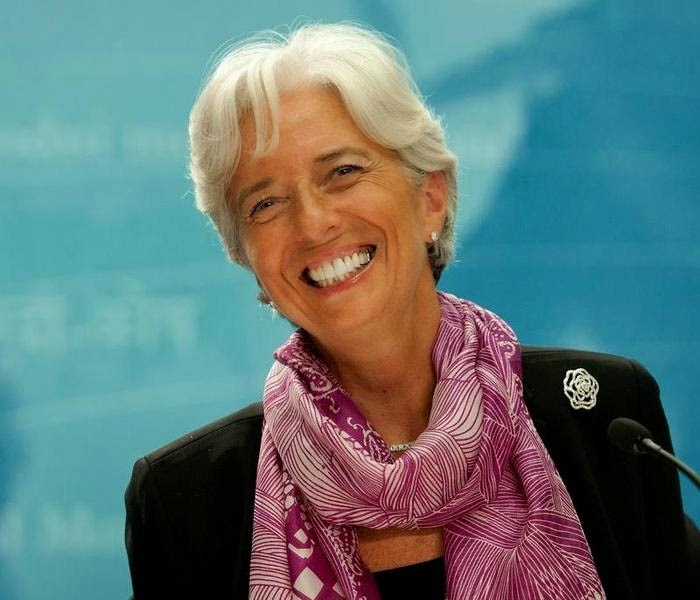 From her silver hair to her big smile to her love of dramatic jewelry, boldly patterned shawls and scarves, and Hermès bags (and oh my, she owns some good ones), Lagarde, 59 in January, sets exactly the right tone for a woman in a position of power—elegant, modern, true to herself, and not afraid (unlike many American politically powerful women) to show that, why yes, she does care about fashion, has the good taste (and good fortune) to buy well-made pieces that will last forever, and the fearlessness to assert that a woman can have real authority in this world, think about what’s on her back, and still be taken seriously! 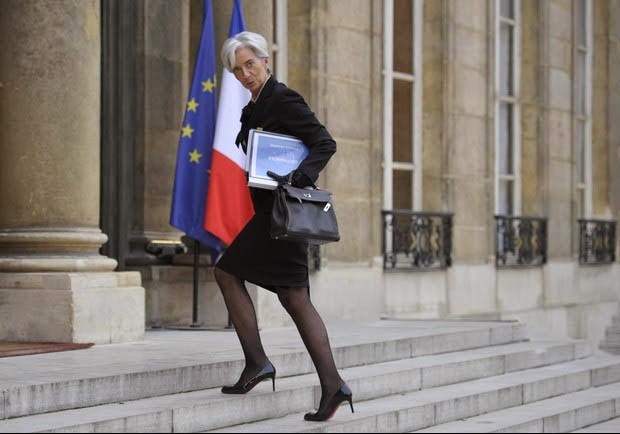 Ms. Lagarde gives me hope that it can be done! 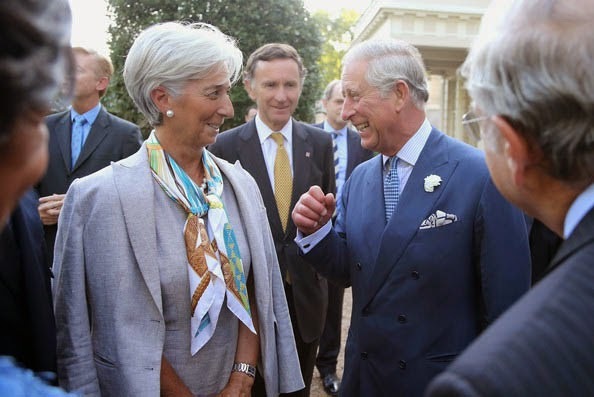 I culled a few of my favorite pictures of Ms. Lagarde from around the internet. There is also a great op-ed piece on her style over at Forbes by Raquel Laneri. It’s a few years old but definitely still worth a read and has an accompanying photo slideshow. If any of you babes out there get a chance to see the exhibit “Women Fashion Power,” do let me know what you think of it. At the White House Correspondents’ Dinner in May. Photo by Abaca. 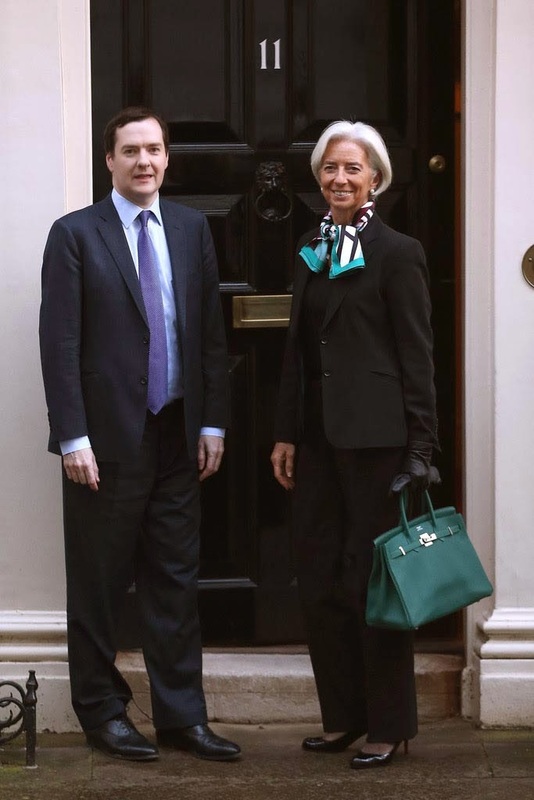 In a lovely scarf and carrying a Birkin in Malachite. Photo by Getty Images. With Prince Charles, July 2012. Another lovely scarf, worn with big pearls! Photo by Chris Jackson. Going to work with her Kelly! And hey, nice legs! Photo by Getty Images. What do you think of Christine’s style? Very well done Jill! Madame Legarde does have great style...and a nice set of gams! I definitely admire here style however I don't need to be so formal these days. Loved the shots your selected...I pinned the one in the evening dress! Just beautiful!